Supporting women and girls attending the Parliament of World’s Religions in Toronto, Nov 1, 2018. Convened by a collaboration of various women’s organizations working in feminine shared leadership. Space is limited and registration is requested by September 30th Special extended deadline. 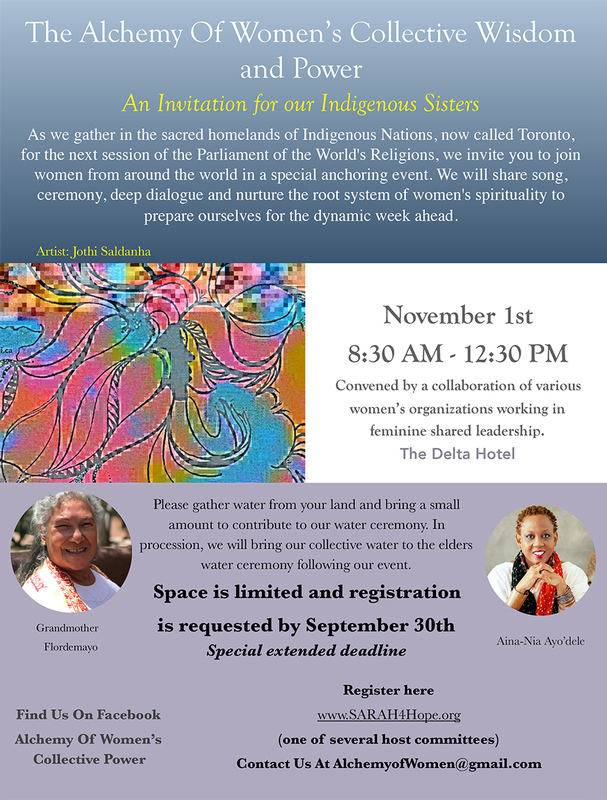 As we gather in the sacred homelands of Indigenous Nations, now called Toronto, for the next session of the Parliament of the World’s Religions, we invite you to join women from around the world in a special anchoring event. We will share song, ceremony, deep dialogue and nurture the root system of women’s spirituality to prepare ourselves for the dynamic week ahead. Convened by a collaboration of various women’s organizations working in feminine shared leadership. Please gather water from your land and bring a small amount to contribute to our water ceremony. In procession, we will bring our collective water to the elders water ceremony following our event.